I guess we’re doing a clutch! The chips we found in the gearbox oil were unrelated to that noise after all. We checked out that reverse idler gear, and found some bits missing from its teeth that corresponded in size and shape to the bits caught by the drain plug magnet. Hardly enough to affect operation, but an important reminder to be gentle with the gearbox once we get this thing on the road. Speaking of the drain plug, we’re reading that this model year wasn’t supposed to have one. Is this... not the original transmission? We have ZERO service history on the car. Huh. I suddenly realized that we made a simple yet critical error. 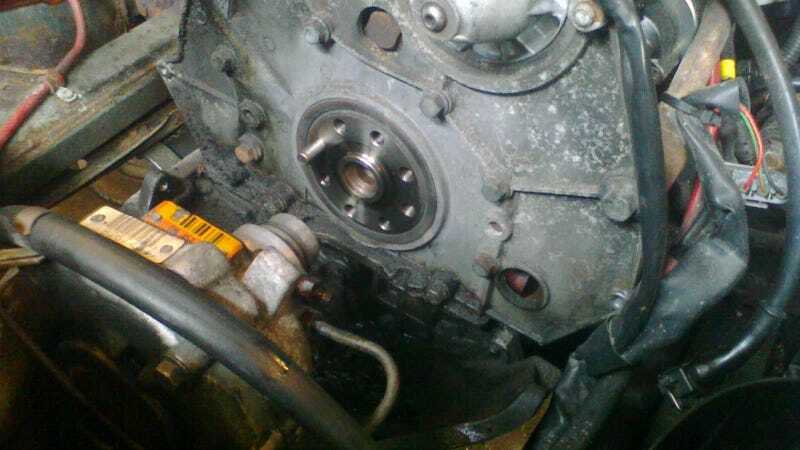 The other day when we ran the engine to listen for noise one more time before taking things apart, I totally forgot to try disengaging the clutch. But when I discussed it with my brother, he said that he had remembered, and that the rattling remained whether the clutch was disengaged or not. So it’s gotta be in the engine, or the clutch. I hadn’t paid much attention ’til now to what it takes to do a clutch job on these cars, but I was curious, as it looks to be SO accessible (front and center under the hood, right behind the radiator). Now, we had a reason to take the plunge and see for ourselves. I hadn’t understood until now why there was an inspection cap on the front of the primary case cover. You can’t see hardly anything behind it, to judge sprocket or chain wear. Turns out, it’s not an inspection cover. It’s an access hole for removing the primary shaft that connects the clutch disc to the upper primary sprocket. Once that shaft is slid forward, the clutch assembly and slave cylinder (after they are unbolted) can be slid out from between the flywheel and primary case. Springs must be compressed during removal. We didn’t do a very good job of that here, but managed to wrestle it out anyway. We’ll be more careful putting in the new parts. But first, the clutch must be disengaged, and a spacer installed between the pressure plate housing and the spring fingers. We’ll get the correct tool later, but to get the parts out faster, we ended up using some (slightly crushed) 1/4" copper tubing from the hardware store. It.. didn’t work very well. Partly because we didn’t get it behind ALL of teh fingers. But we managed to wrestle it out. Still had some life in it. Not putting it back in, though. We removed the flywheel, too. Most of the clutch surface had been brushed fairly clean of rust, but one portion had some light pitting. Hopefully not too much to rule out resurfacing, as new flywheels appear to be unobtanium. Unfortunately, nothing in the clutch, not even the release bearing, answered our questions about the noise we heard earlier. There was some play, where you can move the inner and outer races away from each other, but it still spun smoothly, as did the pilot bearing (both will get replaced anyway before this goes back together, though). So yeah, we’re doing a clutch job. Definitely the most interesting clutch I’ve ever done. Some say that with the right tools, they can do a clutch swap on these cars in as little as 20 minutes! We’ve spent more time than that already, though. But hey, it sure beats having to pull a transmission!